Oh cripes, it’s nearly July and I’m only just posting my May blog. Life sometimes takes over but I’ll be more punctual in future, particularly as I plan shorter but more frequent postings. Due to other commitments I was unable to participate in the bluebell open day so a few days later Philip took me on my very own personal tour. The plan was to take me on an exact replica of the open day tour but as usual we were sidetracked. A couple of hours turned into an entire day (not that I’m complaining). 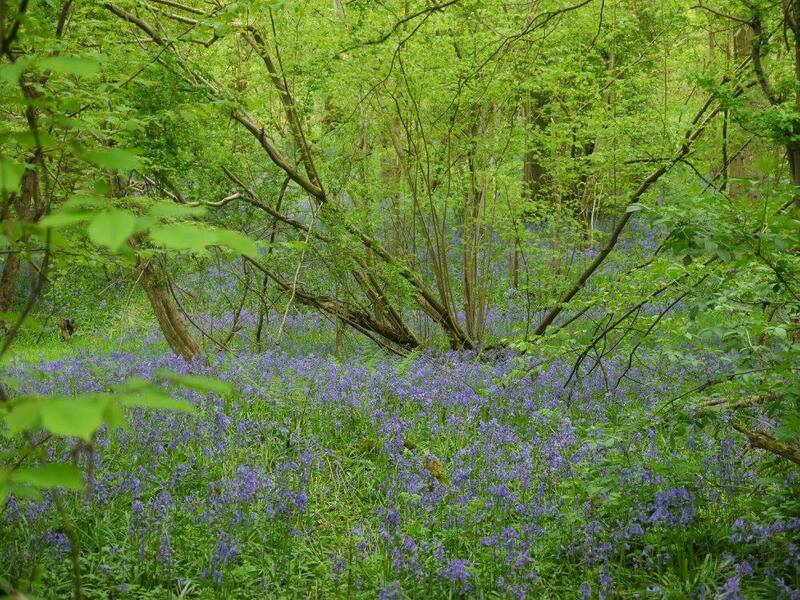 This photograph shows just one of many stunning sights in the wood and why it’s so easy to get distracted. I’m sure most of us have seen the recent media attention surrounding the threat to our native bluebells Hyacinthoides non-scripta. The increasing prevalence of the non native Spanish bluebell Hyacinthoides hispanica and the hybrid between the two Hyacinthoides × massartiana, is now seen as an urgent threat so I asked Philip to clarify the difference between the species. Although relatively subtle, once the differences were pointed out, I was surprised to discover that the bluebells in my garden are not native. I’ve always been so proud of them too! The Spanish species are more common in areas with a high human population and fly tipped garden waste with Spanish bluebells in the mix is suspected to be one reason. I imagine many of us have the Spanish (or hybrid) species in our gardens and I would be interested to hear if anyone actually has native bluebells. A quick, simple way to tell the difference is to look at the stem. The Spanish species has an upright stem with flowers all around it. 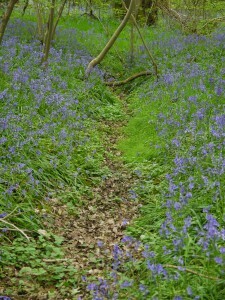 Our native bluebells droop to one side (at the top) rather like a shepherds crook. I found this useful guidance on the Natural History museum website or if you need more pointers this link to a factsheet on the Woodland Trust website. But I’m racing ahead of myself. 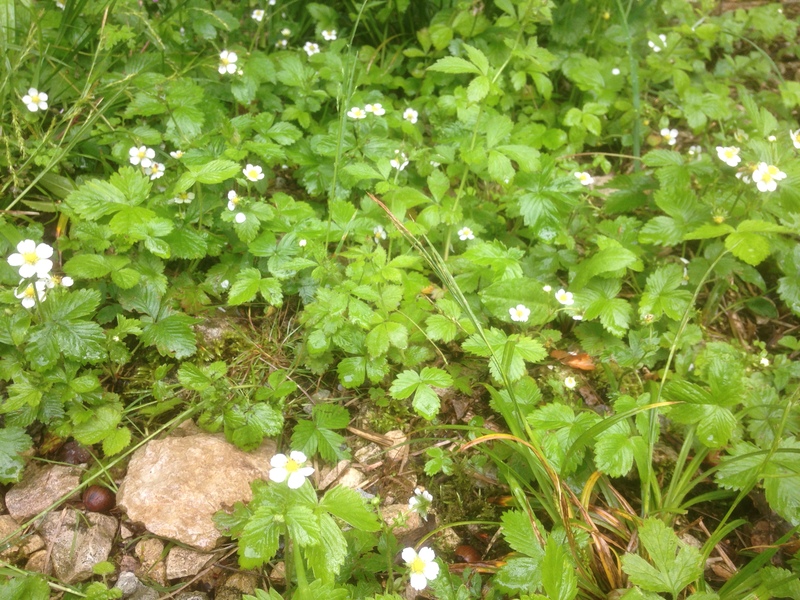 My tour didn’t start with bluebells but with wild strawberries, Fragaria vesca, growing in and around the stones of the ride where they get plenty of sun. They prefer damp conditions and can grow in the shade but are unlikely to produce fruit if they do. The flowers produce nectar and pollen for bees, butterflies and (hover) flies. Honey bees are thought to be the most important pollinators for cultivated strawberries but little is known about the key pollinators of the wild strawberry. Some suggest it’s solitary bees but research is ongoing. 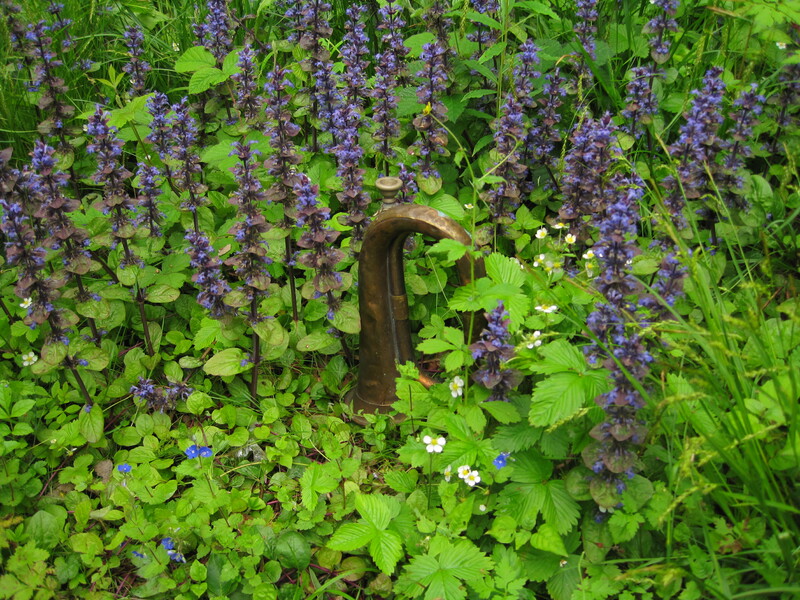 We then moved a few paces to the just opening, bluish-purple flowers of the common bugle, Ajuga reptans. This is a member of the mint family, preferring damp, shady woodlands. The flowers have both male and female organs, meaning it’s able to self pollinate. 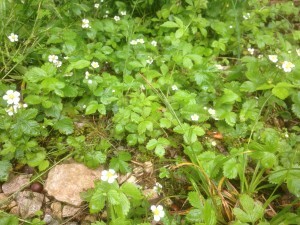 Like the wild strawberry, the flowers are great for pollinators such as bees and butterflies. 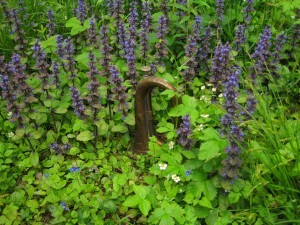 I was surprised (yet again), that I’ve never before noticed the common bugle. Now I’m aware of its existence I frequently see some tucked beneath or near hedgerows. The flowers combined with the reddish-purple leaves really are quite eye catching and I wonder how they ever passed me by. To my amusement Philip fetched a bugle (the brass instrument variety) from the nearby hut and blew into it. He told me when he and his siblings were young, his Father used it to call them in from the wood. It’s now used on open days to rally people together for the start of the tour. A lovely way of carrying on a family tradition. From this photograph I can count at least 22 flowers. 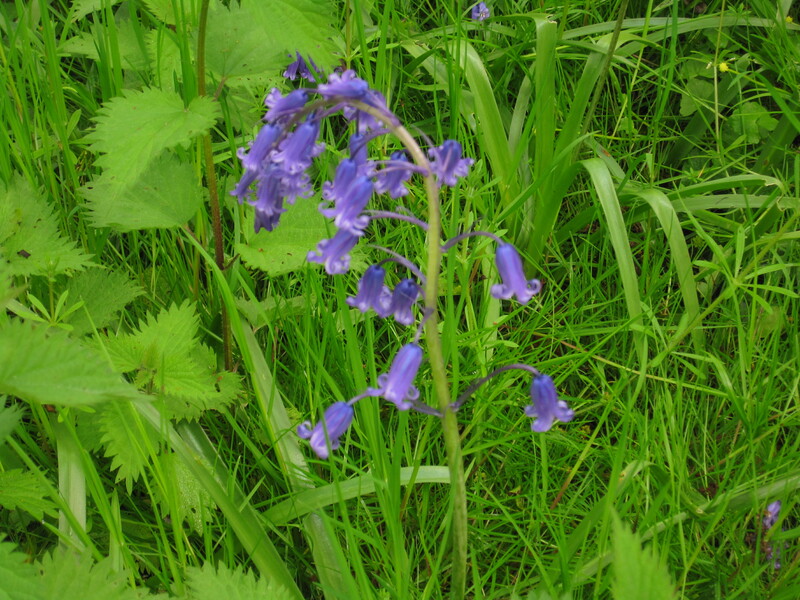 Last month we measured the length of bluebell leaves and not wanting to break with our new geeky tradition, this time we counted the number of individual flowers (the ‘technical’ term is inflorescence) on bluebell stems. The numbers varied from 5 to 16. The average number is said to range from 4 to 16 so our counts pretty much agreed with this. However, we counted others with more than 16 and one with at least 27 bells. Although these high numbers are not unheard of, it is unusual. 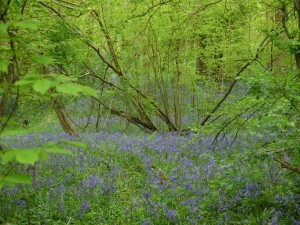 I can only assume the current conditions in Hollington wood suit bluebell productivity very well. Optimum conditions include many factors such as weather, light, temperature, soil and the symbiotic (mutually beneficial) relationship with mycorrhizal fungi. Beneath the soil, the thread like fibers of mycorrhizal fungi connect with most wild plants (including trees) exchanging essential nutrients. 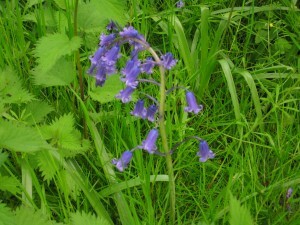 The bluebell for instance gains phosphate from this relationship. Mycorrhizal fungi also plays an invaluable role in maintaining soil structure. This is one of many, many, invaluable services nature provides that we’re often completely unaware of. As we walked on we spotted white bluebells (whitebells?) dotted around the wood. 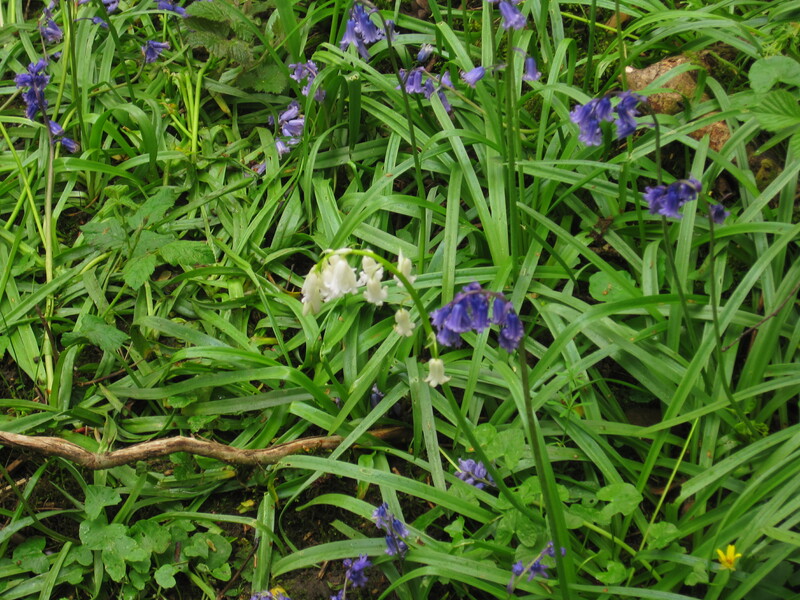 This is a rare genetic mutation which is caused by a lack of pigment and is thought to occur 1 in every 10,000 bluebells. 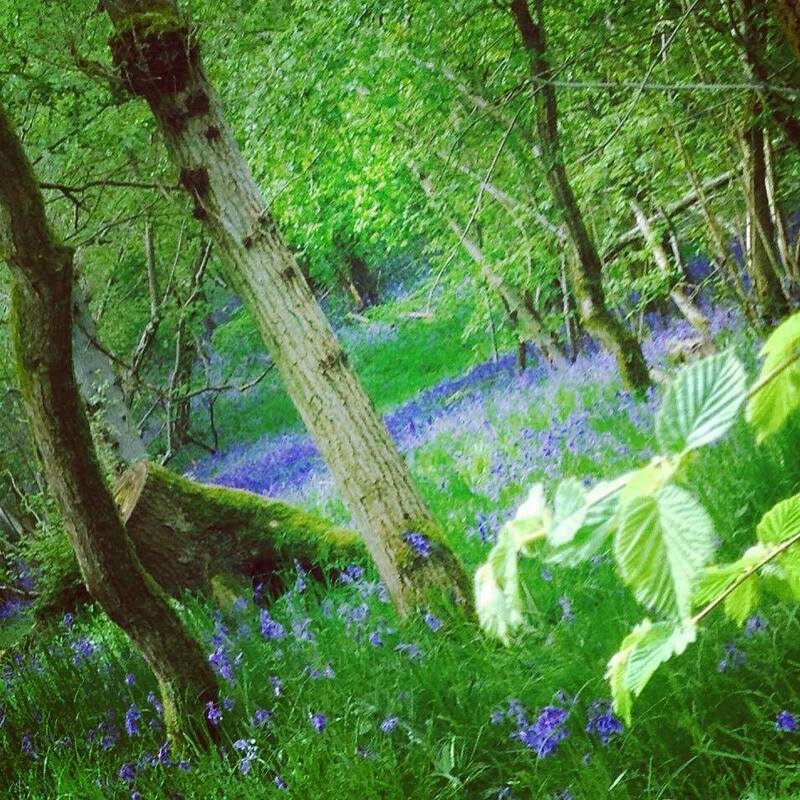 Not wanting to ignore my fondness for folklore, it was once thought that carpets of bluebells were associated with fairy enchantments. 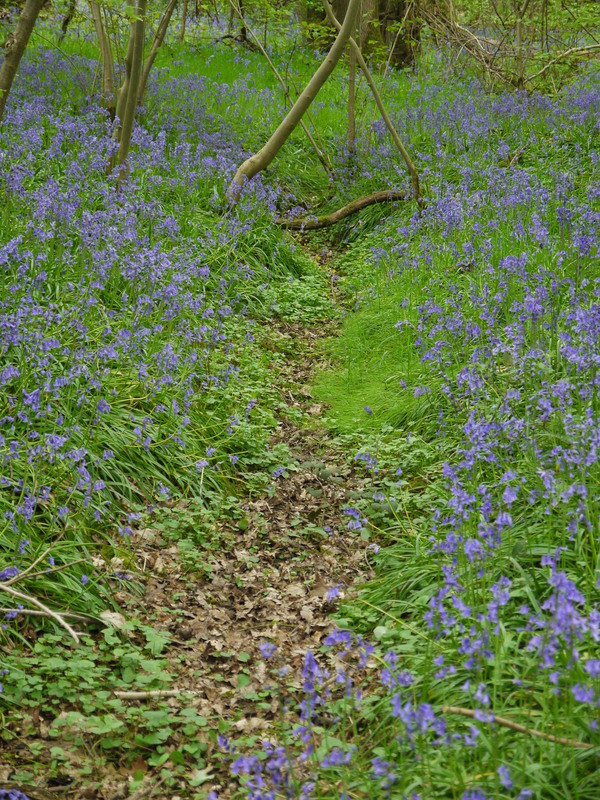 Bluebells rang to call fairies to their gatherings but woe betide any human who heard the bluebell, as they would surely die. And on that cheery note, I’ll sign off just for now. Keep an eye out for more updates on my May visit very shortly.